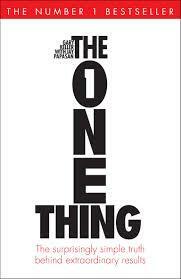 I have read several great books this year, and today I wanted to tell you about what is sure to become one of my all-time favorites called “The One Thing”. One quality that makes entrepreneurs so successful is that they are visionaries. This same trait that makes them successful is also the very same trait that tends to make them lose their focus easily. We are plagued with “shiny object syndrome”. This book written by Gary Keller has a tagline that says, “The surprisingly simple truth behind extraordinary results”. That pretty much sums up what this book is about; the simple truth behind why we struggle so much and how to change that. We want (and need) fewer distractions in our life when it comes to our work. The constant interruptions from tweets, emails and texts cause us to lose focus over and over again when we are working. We all need less on our plate. Most of us simply try to do too many things at one time. We need a way to balance the demands of work and family without feeling like we are short-changing either one. We need a way to get more done with less work! That’s what this book is all about; how to narrow your focus, get more done and spend less time doing it so you can have a better lifestyle. Who doesn’t want that? What Can this Book Help You With? If you read this book and go through the exercises, you will begin to understand that you can only do one thing (at a time) really well. Trying to do a little bit of everything only leads to mediocrity. When you put all your attention on your “one thing” extraordinary things begin to happen. You accomplish more with less stress, and you have more free time in the end. The challenge is to decide what your “one thing” is at any given point in time. That’s an intriguing thought isn’t it? So what does that mean? It means that by focusing on your one thing each day you can have better results with less effort. In short – you will reclaim the life and the lifestyle you lost along the way on this path to entrepreneurship. It won’t take long until you will begin to see some pretty impressive changes. It all starts with the “focusing question”. Gary Keller says, “In a world with no instructions it becomes the simple formula for finding exceptional answers that lead to extraordinary results”. So What Is the Focusing Question? “What is the one thing I can do such that by doing it everything else will become easier or unnecessary”? You may need to read that a couple of times. The first thing that came to mind for me was the need for systems. When you have systems for all the routine aspects of your business, you are free to focus on your “one thing”. So then what’s next? What is the one thing that would bring about the most change for you? Maybe you need passive income. So then you ask yourself the focusing question. What is the one thing I can do such that by doing it everything else will become easier or unnecessary”? If you are a real estate investor, maybe rental property is the one thing would bring you the passive income you desire so that everything else would be easier or unnecessary (I can leave my job). I think you can see how this works. The focusing question can lead you to the answers for your big questions (where is my business going, what are my big goals for this year, what are the top 3 or 4 things I need to accomplish this year), but also the small things you need to focus on now. Ask yourself; “What must I do right now to stay on the path to achieving my big picture items or goals”? It’s really that simple. We must choose what our one thing is today that will lead us to the bull’s eye.